As a single company, Allrig offers a global one-stop shop service. With decades of experience in the energy industry, we can solve virtually any problem. We strive to empower you with quick, innovative and economical solutions- both offshore and onshore. Our expertise is matched by a can-do attitude. With Allrig, you have a dedicated, passionate and determined team working on your behalf. We are there for you when and where you need us – 24 hours a day, seven days a week. In creating Allrig, we combined the forces of some of the best independent energy service companies in the world. As a result, Allrig is able to offer rig and plant owners a one-stop shop service partner with a matching global footprint. 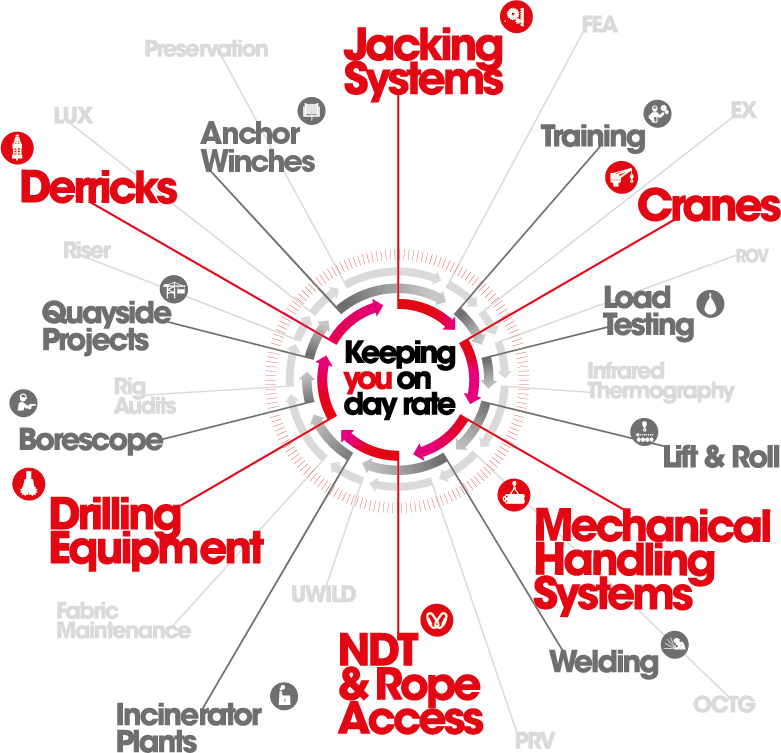 Allrig has well over 100 years of combined crane experience. Inspections, repairs, upgrades or class approved parts? We have got you covered. Our team of API RP2D 7th edition trained inspectors provide inspections services for many of the major drilling contractors around the globe. Allrig has decades of experience of removal, refurbishment, reinstallation and commissioning of full drilling packages including BOPs, drawworks, mud pumps, independent rotary drives and other assorted equipment. cost, faster alternative to new equipment procurement and commissioning. cranes are too costly and not viable. That is why Allrig offers essential rope access services to its customers. We enable you to better manage costs and time in the long run. Allrig offers a variety of inspection and testing services that will maximize your uptime while on contract and minimize the downtime during planned out-of-service periods. With our virtual shipyard concept (‘Total dock’) we can deliver a a pop-up rig project workshop in any quayside, port or shipyard. The groundbreaking service model covers everything from inspection, repair, and maintenance to lifetime extensions, ensuring that you receive the same consistent level of service regardless of rig type or location. Having teams available locally and being able to rapidly upscale according to the project requirements, saving the time and costs of flying in teams from elsewhere, is an important topic in the industry. We understand that in-region presence is crucial to your operational success. With feet and facilities on the ground, complying to local customs, rules and regulations, we are ready to rapidly respond at the time, place and to the scale you require. For those times when a quayside outage is unavoidable, we help you to get back on day rate as fast as possible.